The month of March has arrived. March is significant month with numerous festivals that Indians celebrate with much passion and fervour. Also, with some hot cricketing action happening already and IPL about to commence shortly later this month is all set to keep your evenings busy. To add more buzz to the action-packed month, we are all set to entertain you with a slew of offers and promotions that will keep you on the hook and keep you pushing for more! This Month Deccan Rummy has launched an awesome March Moolah offer which you might be aware of! With the March Moolah offer, players can get 20% bonus upto Rs. 1000 for one of their deposits. A lot of people have already started availing this bonus offer and are boosting their bankroll. 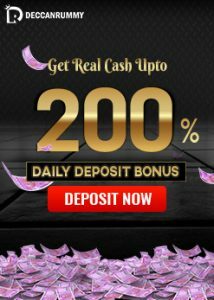 Additionally, we have a series of bonus codes under Deccan Bonus Bounty offer which will help you get 60% bonus upto Rs. 3000. Deccan Bonus bounty is an offer that is popular with a lot of cash rummy players. Split into 4 weeks, each week there is a bonus code available for the users. Want to know what’s up for grabs this week?A fabulous 15% Bonus upto Rs. 750 is available for our Deccan Rummy players this week. Head into the lobby and click on Add cash and pick the one that’s in for this week. That’s a huge weight on your bankroll which could be crucial in helping you get some big wins under your belt. Just make sure you avail them to your advantage. You can use all the bonus codes listed above on their respective weeks and boost your bankroll. Now, if you’re finished with the welcome bonus code already, you’re eligible for this bonus code and what it means is you get something extra along with your deposit. And speaking of the welcome bonus when you sign up at Deccan Rummy and make your first deposit, we’ll match it with a 100% bonus which will be credited instantly. 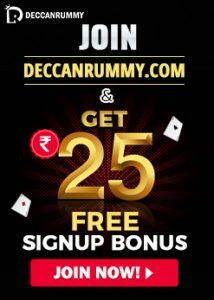 And all you need to do to avail the bonus is a free account at Deccan Rummy – if you haven’t done so yet, do it without further ado. Log in, select Add cash and click on the bonus code listed for this week and get the ball rolling! If you’re looking for an online rummy site that is literally bursting with the best rummy card games – then look no further than Deccan Rummy. Our websites feature a range of rummy variants and tournaments that even the fussiest of players will love our selection of games. Our vast range of games can be accessed through the web, mobile and tabs thus making us multi-platform compatible. Since our inception in the year 2016, our main goal has been to set the highest standards for our product and service. Till date, we are holding to our high standards in providing a flawless gaming experience to our users. Our website uses state-of-the-art advanced graphics, RNG, Fraud prevention algorithms to power our games, and this ensures players have access to high-quality, fast-paced, action-packed rummy tables. Once you land in our website, we can guarantee you will never have a dull moment. We always value our customers and one will quickly realize that everything about Deccan Rummy is oriented around customer satisfaction. 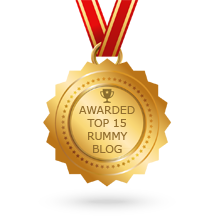 This has helped us a great deal in catapulting us to be one of the most respected and trustworthy platforms in the online rummy business. Deccan Rummy is packed full of exciting bonuses and promotions which the players can take advantage of. From a colossal welcome bonus of Rs. 5000 to free cash rummy tournaments worth more than 20 Lakhs to periodic bonus offers and special tournaments, we are consistently providing our players an opportunity to make a profit. In the following post, we’re going to be taking a look at a couple of exciting bonus offers that are available this month. Every month, we have a tradition of hosting exciting bonus offers for all our players. This monthly bonus offer allows the player the luxury of earning more on their deposits thus strengthening their bankroll. 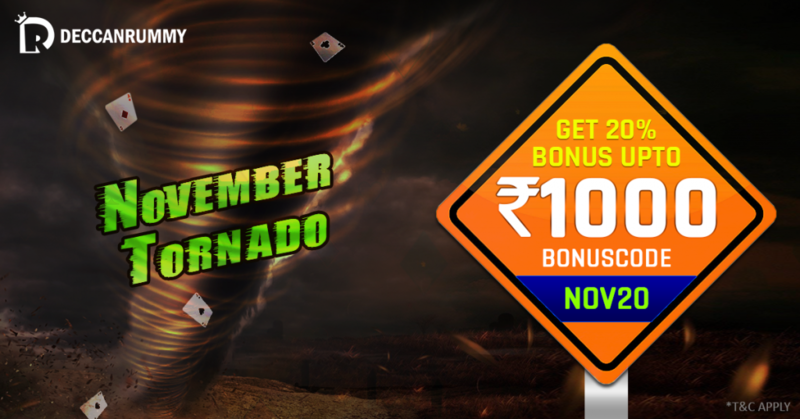 With November Tornado, players can avail 20% bonus up to Rs. 1000 on one of their deposits. Players must use the bonus code “NOV20” while making a deposit. The bonus amount in bonus points will be instantly credited after the successful completion of the purchase. Avail this exceptional bonus and add some extra dazzle to your rummy sessions. 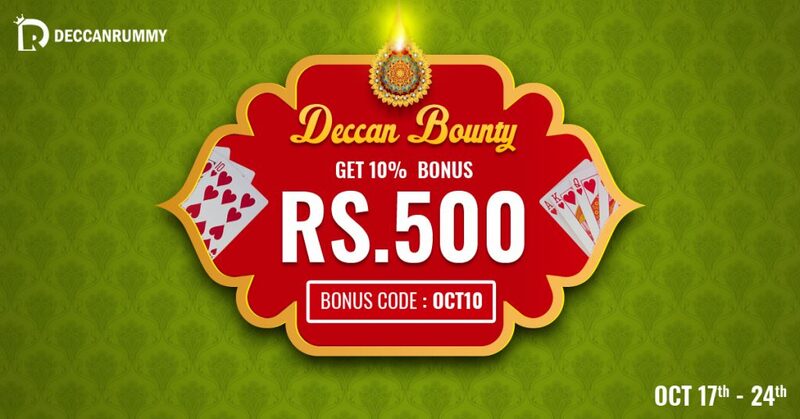 Deccan Bonus Bounty is yet another stunning offer that has been a permanent feature in our list of promotions. Hosted on a weekly basis, this offer is availed by thousands of players. Get 15% booster Bonus up to Rs. 750 for one of the deposits made from Nov 1-8. Use the bonus code “DIWALI” while making a deposit. Come and avail this bonus offer and start earning big bucks. How to avail these bonuses? 3. Enter the amount you wish to deposit and click on the code “NOV20” or “”DIWALI”. Once you click on the bonus code, it will be posted automatically in the Bonus code box. 4. Players can use only one of the two codes given at a time. 6. Select the payment gateway and complete your purchase. 7. After the successful completion of the purchase, the players will receive the bonus amount instantly. These are some exciting promotions that are available current that lend more zing to your rummy game. Most importantly, they embolden your bankroll and allow you the luxury to play more cash rummy games. Why not make the most of it right away? Opportunities don’t knock your doors every day. 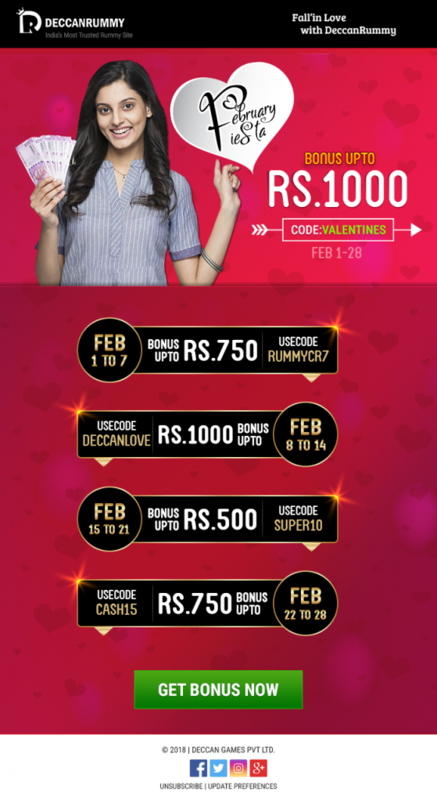 Smarten up and avail these wonderful bonus offers before its gone! Deccan Rummy is one of the hottest and most exciting names in the online rummy community for several reasons. We accept players from India who like to play rummy card game and we provide them with a platform through which they can test their rummy skills online. To make the game-play interesting, we offer multiple rummy variants and tournaments. Players can play these games and have a real shot at winning real cash games. We have striven hard to come up with a platform that really creates an authentic casino experience and much more. Our motto has always been to give our players an ultimate gaming experience. We understand that a great gaming experience always starts with a welcome bonus, so players get that bit extra to play with at the start of their rummy career. To facilitate an easy transition to cash rummy online, we are providing a 100% bonus offer for players who make the first deposit. Players can win up to Rs. 5000 with this unique bonus offer. Additionally, we come up with exciting monthly and weekly bonus offers for all our players. A lot of players have immensely benefited out of these offers and have made a successful transition to cash games. One of the important bonus offers that players continue to be attracted is the Deccan Bonus Bounty offer. The offer has been a grand success since its inception. One of the main reasons for the huge success of this offer is because of the varied bonus types that the players can win every week. Yes, players have an opportunity to win the following bonus types – Booster Bonus, Cash Bonus, and Bonus points. As you are getting busy for the festivals ahead, we are gearing up with lots of offers and promotions. This week players have an opportunity to win an awesome cash bonus with our Deccan Bonus Bounty offer. That’s right! Players have an opportunity to get a 10% cash bonus up to Rs. 500 for one of their deposits this week from Oct 17-24. All you have to do is to make a deposit with the bonus code “OCT10”, your bonus will be auto-credited then. Players can use this bonus code only once during the whole week. How to multiply your cash? Enjoy the best moments of rummy with your friends by inviting them to be a part of our Deccan Rummy family. Nothing comes close to the joy of playing card games with our friends. And you can get an unlimited bonus for life as a reward for referring them. Planning to make a deposit with the help of MobiKwik? Get 15% cash back on 4 transactions over the period from Oct 11 – Oct 30. So, hone your skills and try out these methods to boost your winning. 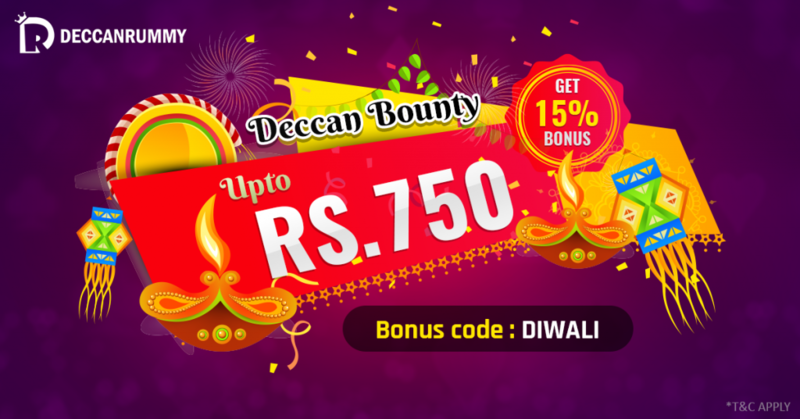 Start with Deccan Bonus Bounty offer and proceed availing other offers. Acquire the bonus; come to the tables to experience the ultimate fun of cash games. India’s fastest website is waiting for you to grab this great deal. Ensure you don’t miss this! Some online rummy sites tend to offer just a small selection of promotions to their players throughout a month but this isn’t the case at Deccan Rummy. In fact, there are daily offers to take advantage of, which the players can check under the section “Hot Deals” under rummy promotion section in our website. Have a great time at our Tables!